At the end of May, I returned to the 1000+ acres of varied habitats that make up the Sandy River Delta for a half-day of birding. The skies were clear and the weather was warm, the start of our long and dry summer well underway although it was technically still spring. The delta is one area I’ve become fond of visiting in the spring for birds that are fairly reliable and seasonal to the region, making a great place to pick up a few species for my list. The warm day was creating currents that brought the raptors close overhead several times during the day. Red tailed hawk and bald eagle sailed along almost lazily, accompanied by wisps of cottonwood seed. A pair of osprey were far more busy. 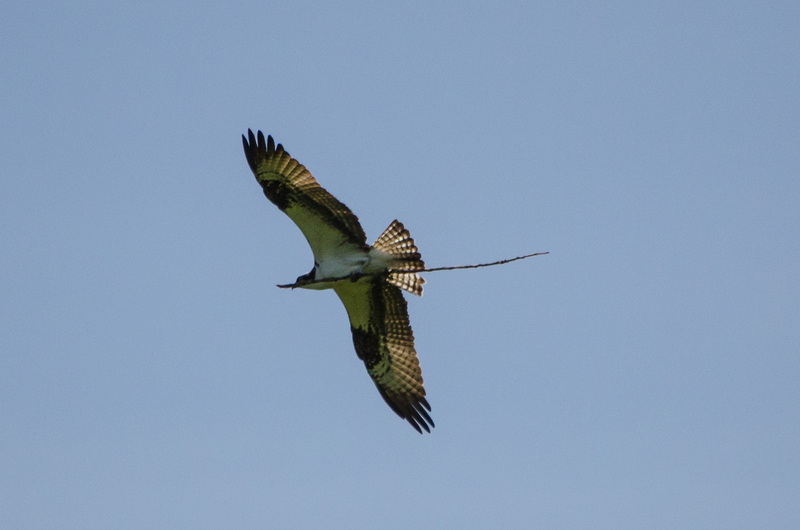 They were spotted several times carrying sticks to a nest location nearby. 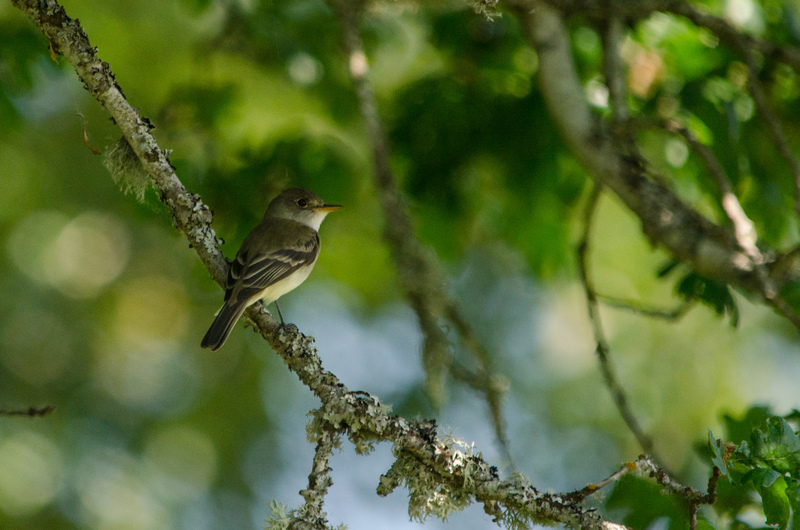 The trees were busy with many smaller birds, including some flycatchers which were determined to confuse the heck out of me when I tried to identify them. (They are some of the most difficult birds to positively identify, since several are nearly identical.) Small differences in field markings, including length of the bill, eye-rings, and wingbars have only slight variations between species. 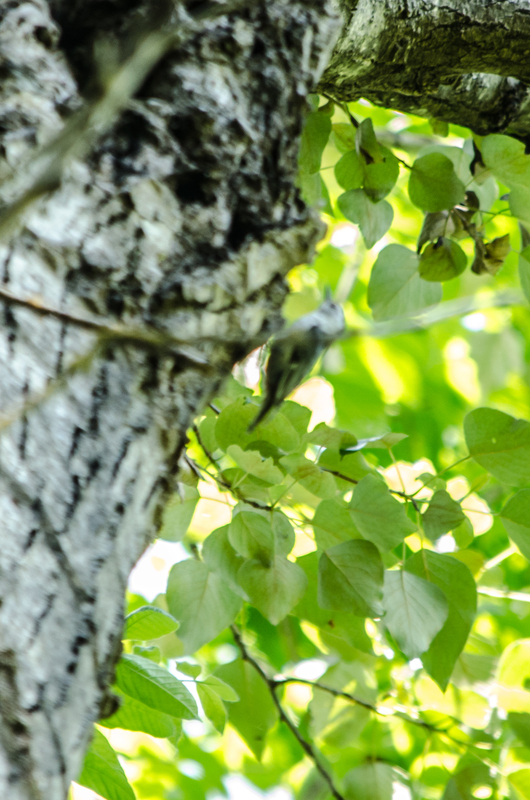 This cooperative bird I believe to be a willow flycatcher, based on the thin eye-ring, drab wingbars, and the size of the bill. I feel confident enough that I’ve added the bird to both my year and life lists. 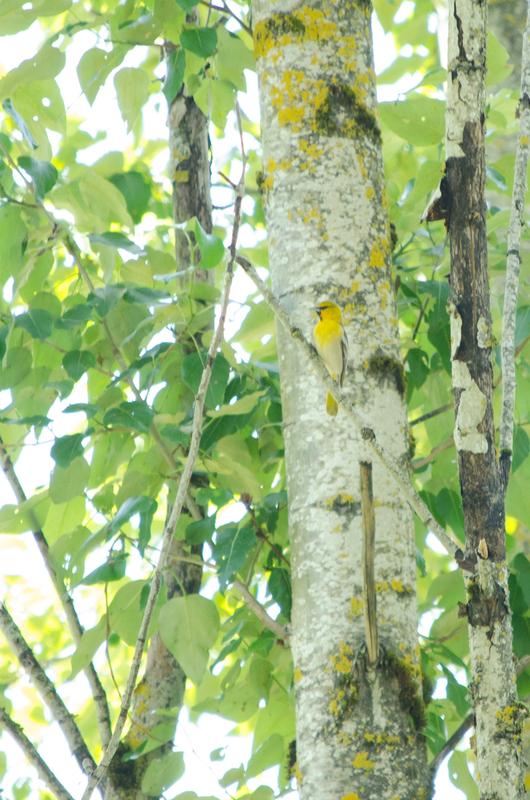 Among the higher branches were one of the seasonal visitors I’d come to look for: the colorful Bullock’s orioles. When removed from their surroundings, the orange on these birds seems almost gaudy, but as this young male demonstrated it is actually a wonderful camouflage when in the right surroundings; the color on females and first-year males in particular blends right in with the lichens and bark of the trees. Adult males are much more orange in color. 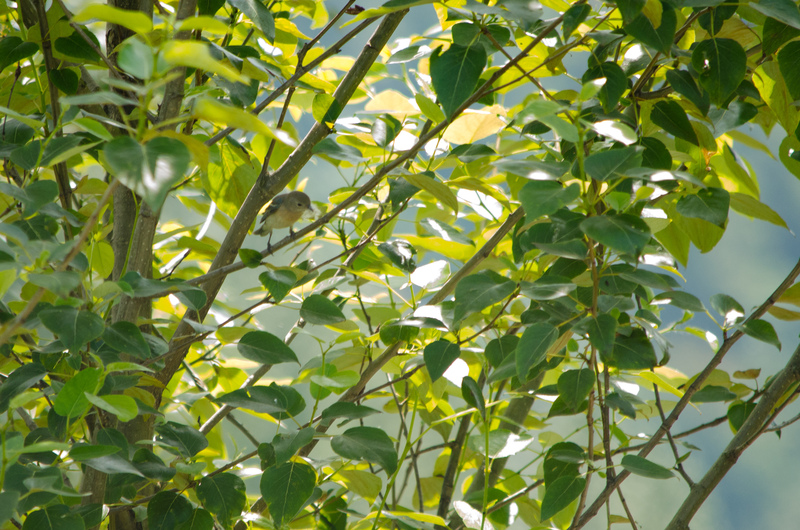 Many birds made photography difficult for me as they moved among the leaves but refused to materialize clearly in view. Another high-up bird gave me some challenges as well. A white-breasted nuthatch appeared but refused to hold still, allowing me only a couple of blurry images. It’s identifiable, but barely – and it’s another addition for the year. 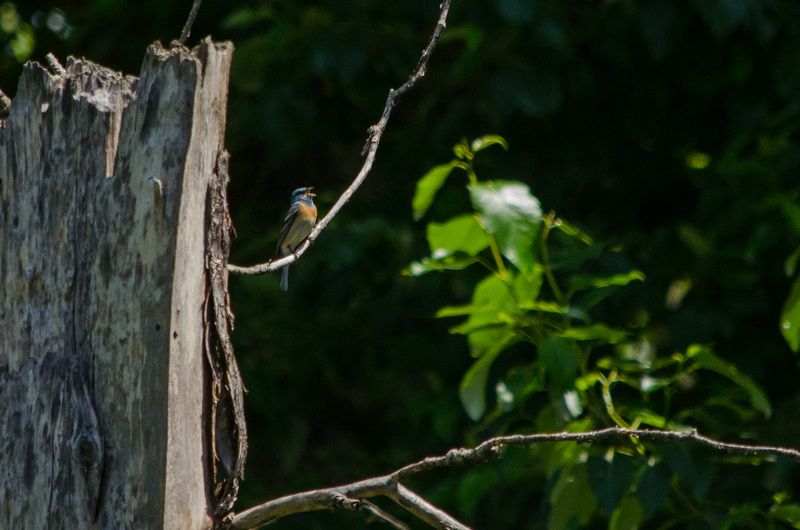 Where the open fields met the trees were flashes of bright blue, and I found another of my target species for this trip, the lazuli bunting. The males are adorned with bright plumage, blue on the head, back, and wings, with a russet red breast; the females sport a much more sensible set of subtle colors letting them blend into their surroundings. 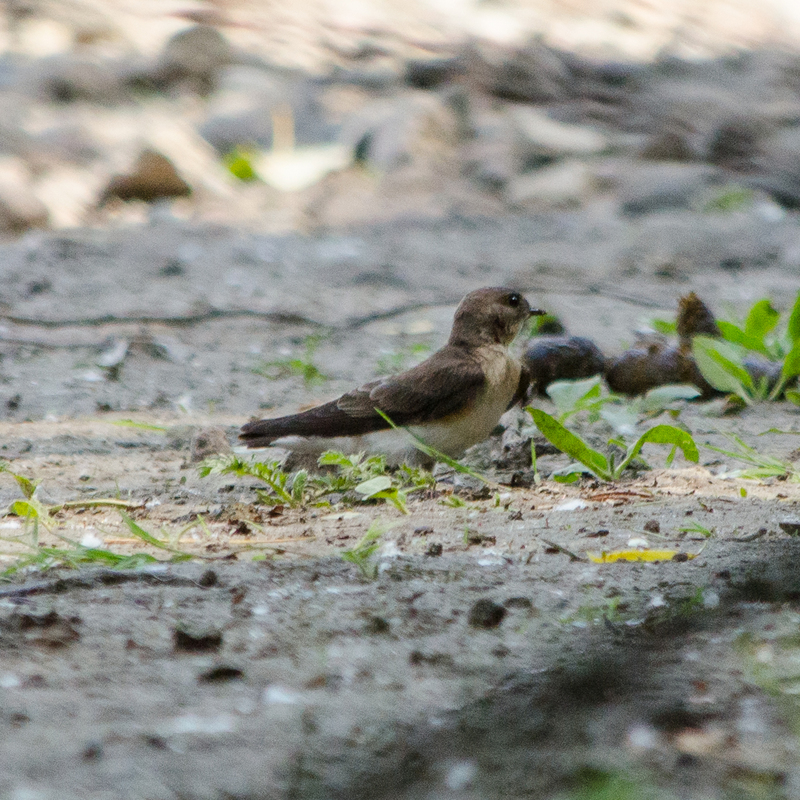 Gathering up some nesting material along the shore of the Sandy River was one more bird for not just my year list, but my life list: the northern rough-winged swallow. 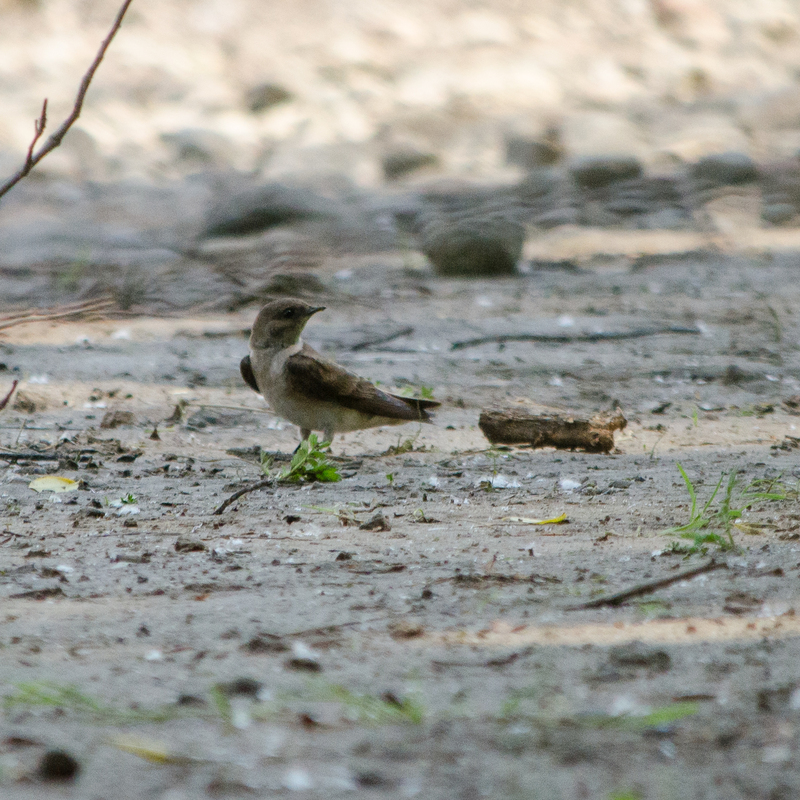 These drab little birds were a lot of fun to watch, with a pair of them coming in fairly close to where I was crouched among the riverside brush as they picked though small bits of twig on the muddy banks. It was a productive trip overall, with the five year list additions (two of them a life list addition, too!) only the beginning. Other birds seen included American goldfinch, American robin, black-headed grosbeak, mourning dove, rufous hummingbird, cedar waxwing, European starling, northern red-shafted flicker, bushtit, house finch, tree swallow, common yellowthroat, song sparrow, savannah sparrow, varied thrush (no pictures, so it’s not yet on the year list), spotted sandpiper, mallard, Canada goose, black-capped chickadee, brown-headed cowbird, downy woodpecker, belted kingfisher, great blue heron, and spotted towhee. Whew! That’s 32 bird species for the day – not the highest count, certainly, but still a busy half-day of birding. There was also a close encounter with a frog, some small fish, and a chipmunk. To find a little more information about the Sandy River Delta and other places for bird watching, including addresses and websites, check out my Birding Locations page.